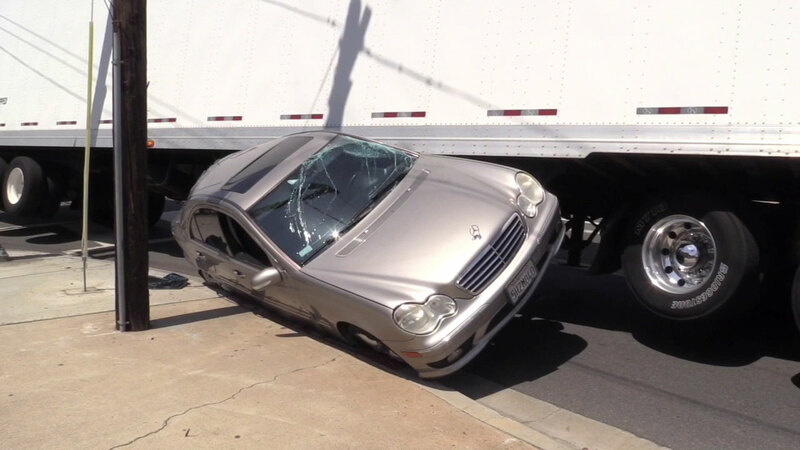 A Mercedes-Benz sedan stuck between a big rig and sidewalk after the driver attempted to pass up the semi-truck in Costa Mesa on Saturday, April 8, 2017. COSTA MESA, Calif. -- A 59-year-old man was arrested on suspicion of DUI after attempting to squeeze his sedan past a big rig in Costa Mesa, California and failing. Costa Mesa police said the truck driver was turning right onto 17th Street from Placentia Avenue shortly after noon on Saturday when the suspect in the Mercedes-Benz tried passing up the semi-truck on the right side. The not-so-slick move didn't work. Though the Mercedes-Benz sustained major damage after getting stuck between the big rig and the sidewalk, no injuries were reported, police said. The suspect, identified as Brian Elder, was arrested for DUI.